Because it can be given as a gift bag, but when the gift is taken out it becomes a card in its own rights. When nothing or a small item is in the bag, it sits at a very slight angle to show off the card and can be tied with ribbon to keep closed. When the bag is filled right upto the top it still sits nicely and the gift can explode from behind the card. There is also a Winter Tilda Magnolia Stamp, Stamped onto Shrink plastic on the back that is a little magnet. Accessories: Brads, Metal Flowers from stash, Die Cut Words from Crafty krafts & Flowers from stash. Swirl rub on from Dovecraft Rose Tinted Christmas Range. 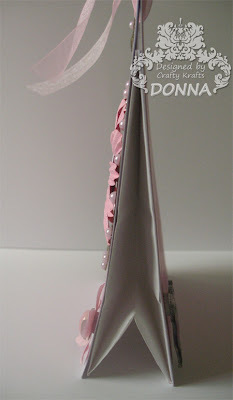 Papermania Adhesive Pearls & Stampin up Punch. 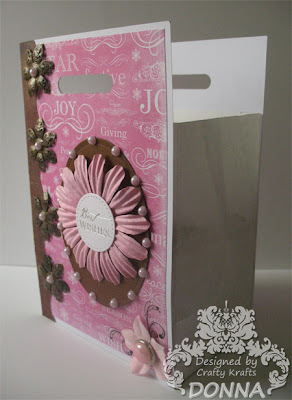 This entry was posted on 18.9.08 and is filed under Magnolia Stamps , Stampin Up . You can follow any responses to this entry through the RSS 2.0 feed. You can leave a response, or trackback from your own site. I absolutely love this Donna, for some reason I really need to buy that paper (lord knows why, I really don't like pink but I seem to be stuck in pink at the mo). Please take a look at my blog, there is something special for you! Donna, this is absolutely fab!! What a great idea.